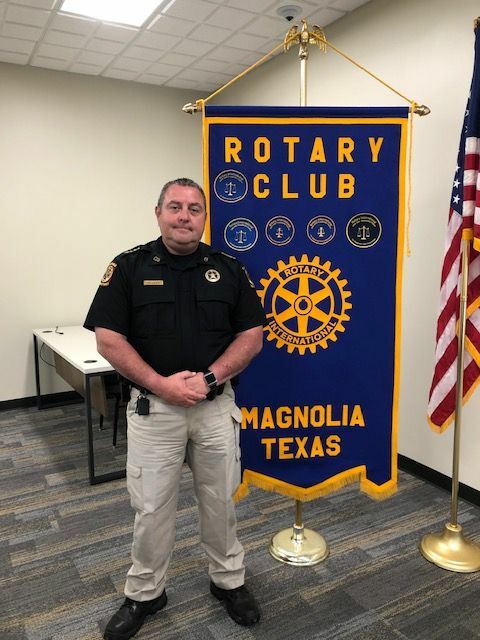 On April 9, 2019, Constable Chris Jones spoke to the membership of the Magnolia Rotary Club about what the constable's office in Montgomery County does. Pictured above is Constable Chris Jones. Constable Chris Jones told the group that he grew up in Magnolia (close to Frank Parker) and graduated from Magnolia High School back in 1991. He then went to Sam Houston State University where his first major was finance. Because Sam Houston University had one of the top criminal justice programs in the country, He decided to take some criminal justice classes and just kind of grew interested in the possible vocation. He ended up switching his major to criminal justice and graduated there in 1996. After graduation, Chis went to work for David Hill at the Montgomery County Constables office in Precinct 5. Chris has been in law enforcement for 22 years, all of which were by David Hill’s side. After Constable David Hill announced his retirement in September of 2018, he suggested to county officials that Chris Jones, chief deputy at the time, be appointed to finish his term. 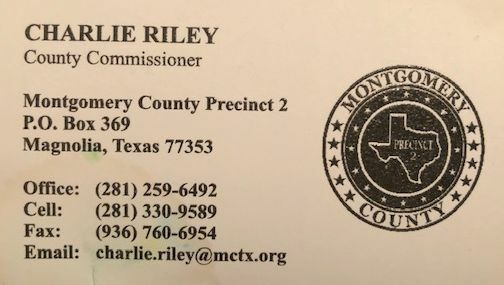 Jones was appointed by Montgomery County Commissioners Court on Sept. 25, 2018 to finish Hill’s term. Chris also expects to run for the office when his current term is up. Constable Chris Jones told everyone that one of the main questions he always gets asked is what is the difference between the Constables & Sheriff's offices. Chris told everyone that in general, Constables generally serve civil processes but are also peace officers and may enforce criminal law. However, their jurisdiction is limited to the precinct they work out of. On the other hand, the Sheriff and his office deals with criminal cases. Both the Constable and Sheriff are elected while police officers usually work for a municipality. The Constables office usually handles civil processing of court orders including serving warrants and seizing property as well as working closely with the MISD School System. Constable Chris Jones has a total of 40 people working for him. His jurisdiction area is quite large and goes all the way from the Harris county line on the south between Hwy 249 and Hwy 2978 north almost to the city of Conroe, Texas. When asked about the Constables relationship with the MISD School System, Chris explained that his office has a contract with MISD to provide safety and security to all the schools in the Magnolia ISD area. 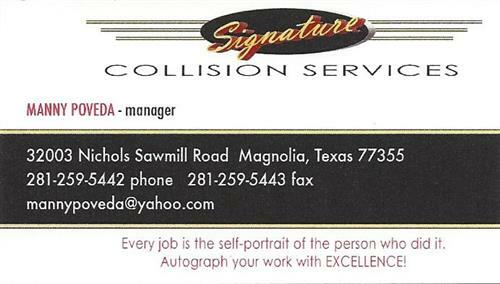 Chris further explained that his office has had a relationship with the Magnolia ISD for about 20 years. His office put the first deputy as a school resource officer in the late 1990s, and the administrators liked the way he worked. Over the last 20 years, his office has grown and now has 18 school resource officers across the campuses. There are two deputies at every high school and 1 deputy at every other school. Chris explained that his main focus is the safety and security of everybody on those campuses—not just the students but the teachers, principals, staff and any visitors. Chris also told everyone that they have had a positive impact on the campuses as his deputies work hard to talk to students and let them know they are there to help them. Chris further stated that his office has a great relationship with the community and all the schools in the district. He continues to work at making that relationship better and better. Denise Meyers told everyone that MISD has two Directors of Security, one for the high schools and one for all the other schools. Both directors work very close with Chris's office. Constable Chris Jones then took questions from the Magnolia Rotary Club membership for about 15-20 minutes. Chris also stated that he gets a lot of questions asking if the drug problem is really that bad in Magnolia now. His answer was no. The reason people are just now hearing about it is because his office is proactively going after the drug issue and arresting people with their proactive patrol and investigator division. Rotary Member David Arevalo told everyone that he is currently in the Citizens Police Academy and that he is in awe of all the training that the Constable and Sheriff's offices go through.